HENRY SARTAIN: (1833-1895) Preeminent printer of engravings in Philadelphia. As artists, printmakers, and educators, the Sartains played a central part in Philadelphia’s and America’s art community. 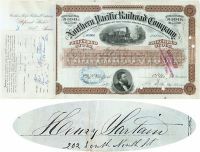 1876, Northern Pacific Railway Stock certificate for 14 shares issued to and signed a member of the most illustrious and influential families in the history of art in the United States, Henry Sartain. Attractive certificate with ornate border, vignette of a train passing by telegraph lines in the countryside and a lower vignette of Fredrick Billings. Brown/Black. Signed on verso: "Henry Sartain." Also he has penned in his address: “202 South Ninth St. Philadephia, Pa.” HENRY SARTAIN: (1833-1895) Preeminent printer of engravings in Philadelphia. As artists, printmakers, and educators, the Sartains played a central part in Philadelphia’s and America’s art community. ***Punch hole cancellations not affecting signature. Very Fine.